photo right The Real Shetland Company is changing... soon RSC will become an information resource for announcing and showcasing some of the latest news and updates from within the Real Shetland Wool World. 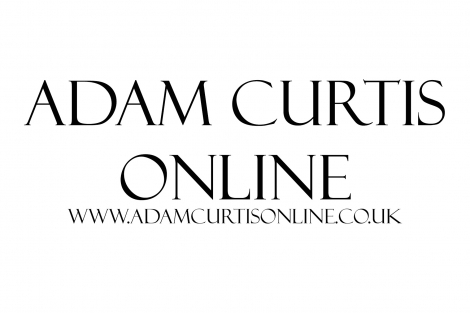 This means that all online trade will be moved to our new retail website Adam Curtis Online, aka ACO. At the heart of ACO is our core range of Real Shetland Wool products but it also features other exciting new products from our very own, Adam Curtis. The very same high standard of products and service will be offered and The Real Shetland Company is not going anywhere, this is purely a change in where to buy Real Shetland Wool products. All product listings will remain on this website, along with pricing for most but do expect a redirect to the new website if you try and buy from RSC.com. If you have any questions or concerns, please don't hesitate to contact us on our contact page and please do go check out our lovely new website. The launch of ACO is accompanied by our new blog site on Wordpress, please follow us here. ACO is also now on Twitter, please follow us here. 1. It is natural. We get wool because we keep sheep primarily for the meat industry so as long as we like our Sunday roasts we will have sheep and it would be a crime not to relieve them of their winter coats at this time of the year. So, wool is a ‘gift’ of nature, the sheep benefits from having it shorn off, we get a raw material that has cost the planet a minimal amount because it is a by-product of another industry and therefore has a tiny carbon footprint. 2. Wool, particularly British wool, is very springy. It has natural ‘crimp’ which makes it perform like a jack in the box. 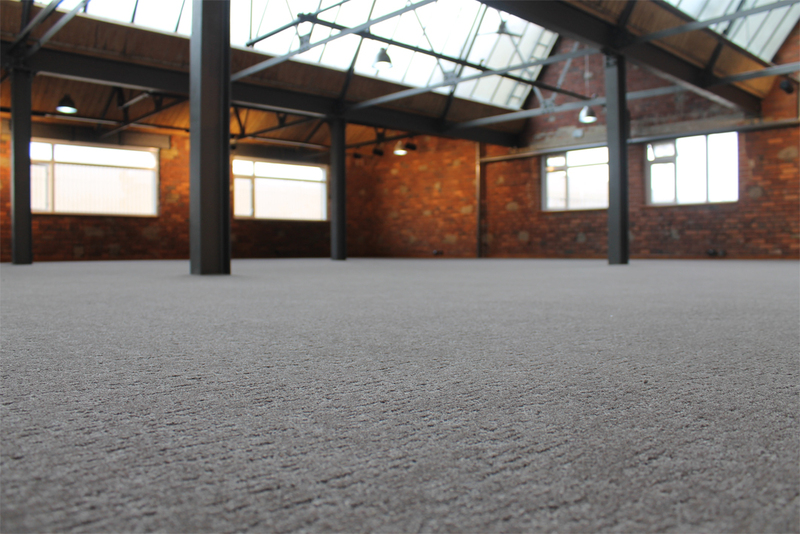 It wants to bounce back to its natural state - we sometimes call it ‘bouncebackability’ and in a carpet you can imagine how it helps to keep it looking fresh and new and not flatten like some less than natural fibres do. 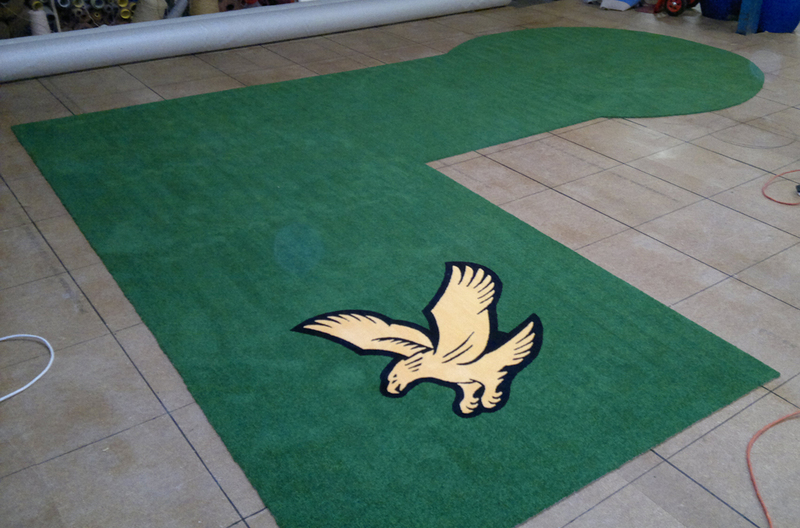 It also makes the carpet wear better, last longer and therefore saves money. 3. It is naturally fire resistant. In a fire the smoke it gives off is not poisonous - of course it isn't good for you but it is not like inhaling burning tar or plastic. 4. It is easy to clean - we have a carpet cleaning expert as a member of the WCFG and he says wool carpets can clean better than synthetics and look better after cleaning! More later...but you do not need to use a poisonous chemical like bleach to clean a wool carpet - remember to keep bleach away from children and small animals. 5. It feels better...yes I said it…I am sorry because I am not supposed to knock the competition but I can't resist. I like to lie on the floor when watching television so I can vouch for the fact that wool carpets and rugs feel better and also that they have great bouncebackability. photo right The third Harrogate Christmas Market takes place on Thursday to Sunday on 27-30th November. You will find us opposite the carousels between Cold Bath Road and St. Mary's Walk (Stall KO3). A very very attractive location in Harrogate Town Centre, at the bottom of Montpellier Hill just past Betty's Cafe & Tearooms. We have lots of genuine Real Shetland products plus some wonderful Weekend Specials? Beat the Christmas rush and bag those bargains whilst stocks last! We are delighted to announce that our REAL SHETLAND THROWS have been selected in the 2014 shortlist for BEST SOFT FURNISHINGS. Excellent Order of the British Empire) for her services to the design industry. offices, Head of State Palaces, and the private residence of numerous diplomats. control within the design perimeters. regarded as one of the most prestigious acknowledgment of design excellence. 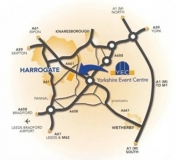 photo right The Curtis Wool Direct group of companies will attend The Flooring Show In Harrogate this September. It is the first time the wool merchant and early stage processors have taken space at the event. 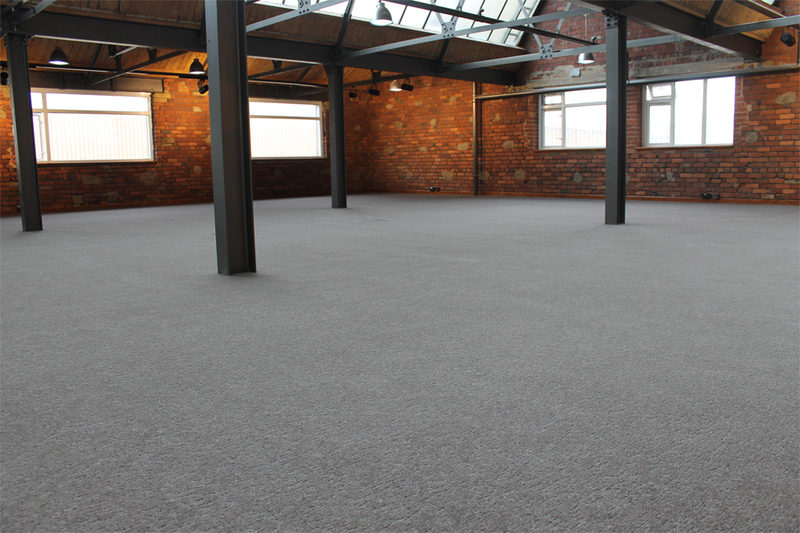 Their presence will be a surprise to many in the flooring industry as they do not sell yarn or carpets and will certainly not be doing so at the show. 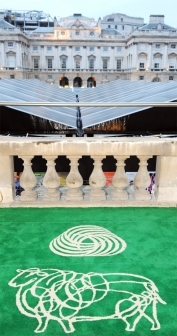 "The Flooring Show is the most important event in the United Kingdom carpet industry`s calendar and showcases the wonderful array of wool carpets and rugs that are on the market today. 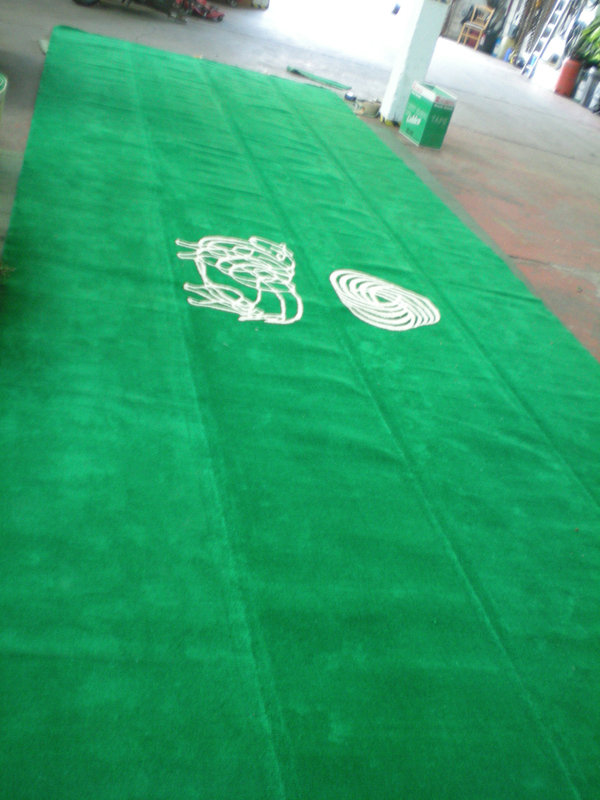 Most of the carpet tufters and weavers who attend the show will be featuring products that are made from our wool. 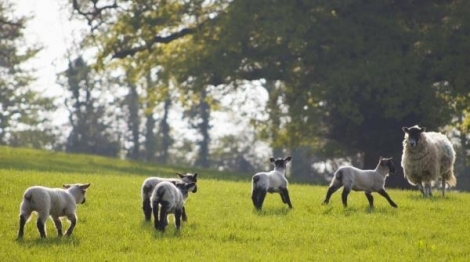 We are here to support each and every one of them and we will be able to show manufacturers, retailers, interior designers, architects and other visitors exactly what wool is, how it is processed and why it is such an environmentally friendly product. 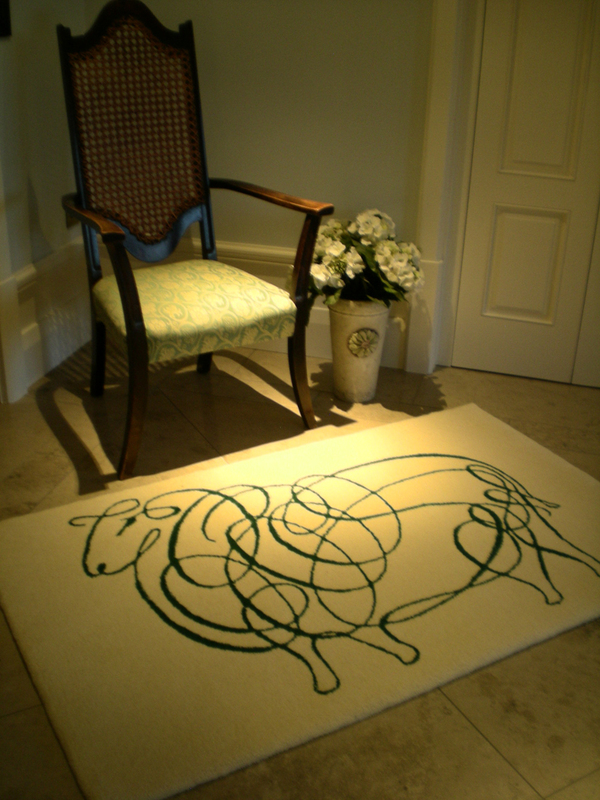 We will explain why wool makes the best floor coverings." The Curtis Wool presentation will get down to basics! Most people involved in the industry and most households "know" that wool makes a better carpet. Expert knowledge from ENco, the environmental consultants and Haworth Scouring and Haworth Combing Companies will be complemented by experienced wool traders who`s job it is to ensure that manufacturers get the right type of wool for their end product. David Gisbourne, MD of Haworth Scouring, says, "The number of visitors we show round Haworth Scouring is growing each year. From Royalty to students, from retailers to farmers and sheep shearers, everyone is fascinated by what we do. We are always told that they didn`t know what had to be done to the raw wool to get it into a state that downstream manufacturers can spin it, weave it and tuft it! The scale of the operation comes as a surprise as does the level of long term investment that we have put into the industry. We are very happy to show people what we do and why we are confident that what we produce and how we produce it is as good as it gets." If you weren't already aware, here at Real Shetland we don't just make products for ourselves out of Shetland wool we actually provide a custom service where we can create your own floor covering or woven item out of a wide selection of materials. Past custom projects range from unique one-off items for special events to bespoke gifts to reproducing our standard products in custom designs; given enough time we are able to make just about anything. photo right The Campaign for Wool is excited to announce WOOL HOUSE: the world’s biggest ever celebration of Wool, taking place from the 13th to the 24th of March in London’s historic Somerset House. The 12 day showcase is to be curated by renowned designer Arabella McNie. From interiors and crafts, to the world of fashion, all aspects of our favourite natural fibre will be explored. Jamieson and Smith's Sandra Manson attended from the 15th - 17th March demonstrating Real Shetland Lace and Fair Isle knitting. On the 1st and 2nd of September 2012 The Real Shetland Company will be once again be attending The British Wool Weekend at The Great Yorkshire Showground in Harrogate. This year we are representing The Real Shetland Company and Jamieson and Smith so if you would like to have a first look at some of our brand new Shetland products please drop by and say hello. The gates are open between 10am - 5pm on Saturday and 10am - 4.30pm on Sunday. 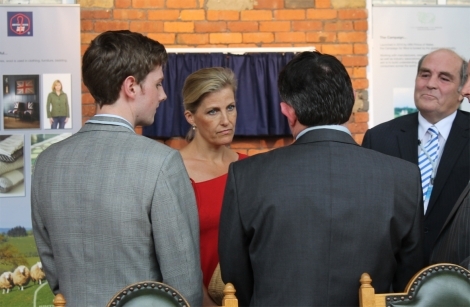 Whilst visiting Haworth Scouring, The Countess had chance to meet a number of players involved in British Textiles and opened Haworth's stunning new showroom, 'The Wessex Room'. The Wessex Room is not just your ordinary showroom, this particular room has been carpeted in our very own 100% Real Shetland Wool carpet and was admired by all who took part in the Royal visit. photo right The evening of the 9th May saw the launch of Real Shetland Yarns at the Shetland Museum and Archives on the Shetland Islands. 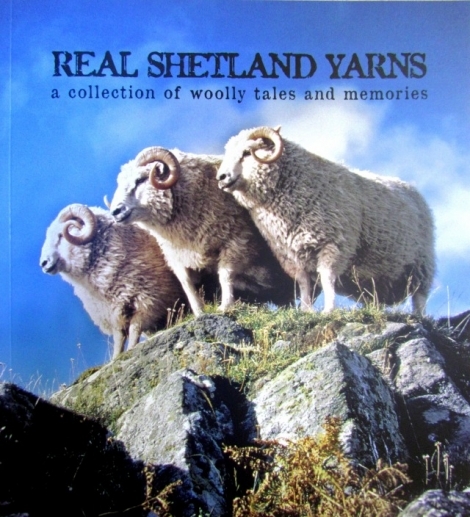 'Real Shetland Yarns: A collection of woolly tales and memories' contains forty stories from people about their lives, their memories of Shetland and how they are inextricably linked with wool, crofting and textiles. This collection of short stories, beautifully illustrated with personal photographs, invites the reader to experience and understand the writers’ way of life and the islands themselves. The book was actually born out of a competition sponsored by Vi-Spring and DNB where Islanders were invited to send in their short stories with the best story winning an exclusive Vi-Spring bed. A number of Shetland organisations and supporters collaborated to make this book possible including Curtis Wool Direct Ltd, The Shetland Amenities Trust, Promote Shetland and of course Jamieson and Smith. If you would like to purchase a copy please go to our Real Shetland Books product page for pricing and delivery info. 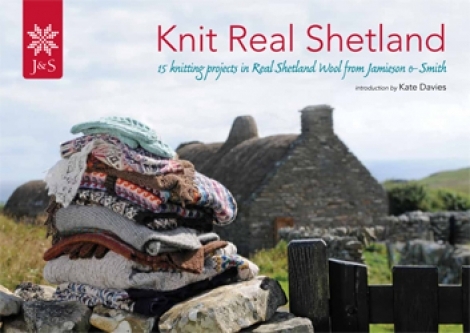 photo right Real Shetland are proud to announce that our good friends over at Jamieson and Smith have launched a special knitting book called Knit Real Shetland. This is their first ever publication which includes 15 Knitting Projects in Real Shetland Wool from Jamieson & Smith and an introduction by Kate Davies. The book brings together local luminaries with international designers to show how Real Shetland Wool and Shetland's knitting heritage and culture has developed over the 65 years of Jamieson & Smith. Designs included by: Jared Flood, Daniel Goldman, Gudrun Johnston, Mary Kay, Sandra Manson, Jean Moss, Mary Jane Mucklestone, Toshiyuki Shimada and Grace Williamson, Lesley Smith, Candace Eisner Strick, Hazel Tindall, Joyce Ward, Woolly Wormhead, Masami Yokoyama. To purchase your copy please go to our Real Shetland Books product page. photo right We would like to congratulate Mrs Hilary King of Welwyn, Hertfordshire for her winning entry to our Campaign for Wool Bumper Sticker Competition. "Wool, that's the wonder of ewe"
Her entry was chosen out of hundreds of brilliant entries by Mike Read of Magic1548 who read out the winning slogan on his Sunday morning radio show. 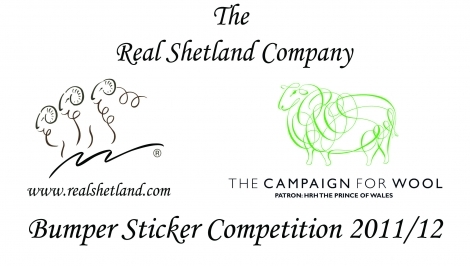 Mrs King will have her winning entry turned into a Campaign for Wool bumper sticker which will be available through The Real Shetland Company. A limited number will available free of charge but numbers are limited and it will be a case of first come first served. Keep your eyes open on here and our Twitter account for more info on when the bumper stickers will become available. Mrs King will also receive an exclusive Real Shetland throw and have the opportunity to visit Haworth Scouring for a VIP tour of the scouring and combing facilities where ALL Real Shetland wool is cleaned and combed before going into our products. Mike Read of Magic1548 is to announce the winner of our recent The Campaign For Wool Bumper Sticker Competition on his Sunday morning radio show on Magic1548 between 7-10am Sunday 8th April. Please either tune in on the radio to 1548am between 7-10am this Sunday or click the link below to take you directly to the Magic1548 Player to stream live via the internet. You may also search for Magic1548 on your DAB radio. Good luck to all entrants and Happy Easter!! photo right Real Shetland throws are featured in the 'Weaves' feature in Country Homes and Interiors February 2012 issue ...see page 70. Vi-Spring win House Beautiful GOLD Award using Real Shetland Wool! photo right LUXURY bed maker Vi-Spring’s Shetland range of beds has won gold for the best wool product in The House Beautiful Awards. The company is working with Jamieson & Smith Shetland Wool Brokers to fill their beds with Platinum Certified Real Shetland wool hand crafted in their Devon workshop. Shortlisted in the best wool product section were Real Shetland Wool Throws by The Real Shetland Company. Shetland Islander wins Luxurious Vi-Spring Shetland Bed. photo right Ollaberry resident and Crofters Commission chairman Drew Ratter won a Vi-Spring during a literary competition at the recent Shetland Wool Week. Having spent a few weeks with his new luxury item, Mr Ratter said: "I think this is the most comfortable bed I have ever slept in, and I am absolutely thrilled to have won it. “I think the achievement by Shetland Wool Brokers in getting a strong marketing relationship with a top end company like Vi Spring is a terrific one." BY POPULAR REQUEST THE BUMPER STICKER SLOGAN COMPETITION HAS BEEN EXTENDED UNTIL 31 JANUARY 2012. 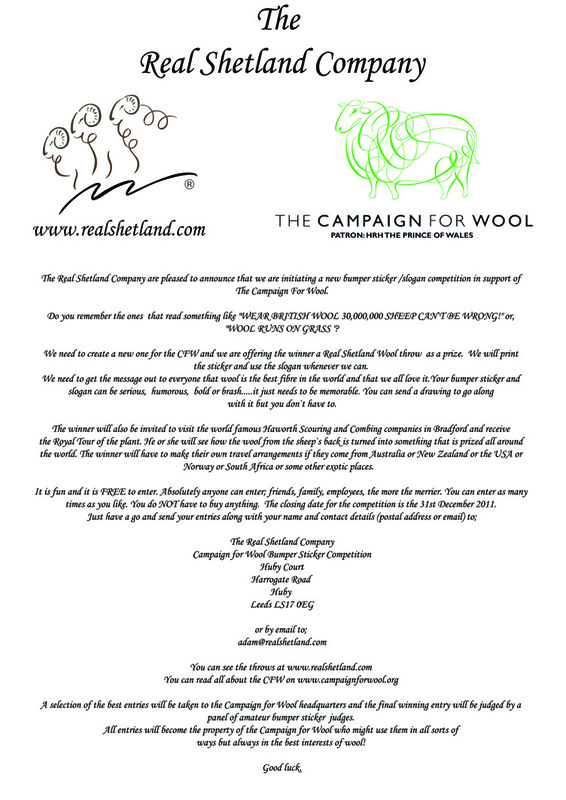 The Real Shetland Company are hosting a new competition in support of The Campaign For Wool to create a new bumper sticker or slogan to promote the use of Wool. A similar competition was held a few years ago with the great success and this time not only do you get the chance to have your creation viewed up and down the country but The Real Shetland Company is offering one of our Real Shetland throws as a prize to the winner. 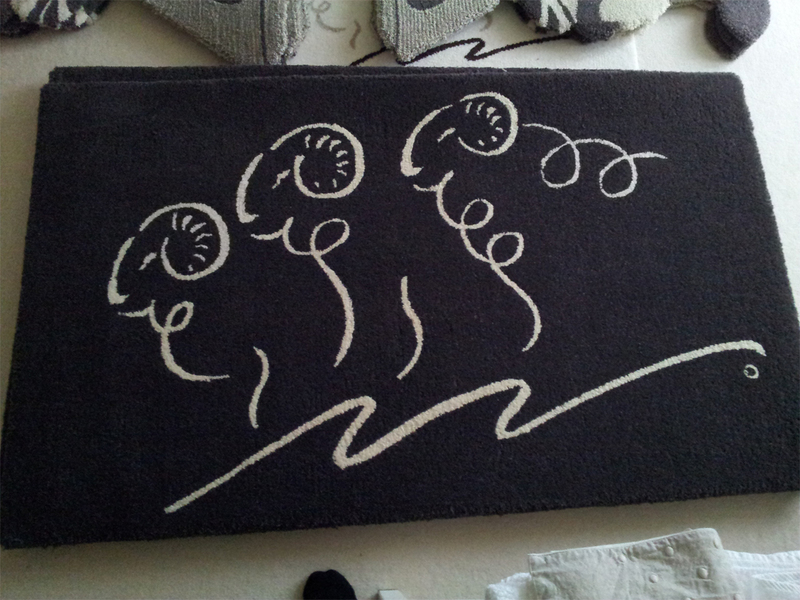 We will give you your choice of design out of our stunning new range of Real Shetland wool throws. We would also like to offer you a tour around the scouring and combing plant where the Shetland wool that goes into making our wonderful throws is cleaned and combed into nice soft, fluffy wool (Please note that travel to and from the tour are not included in this offer however Yorkshire tea and buscuits are). It's a fun competition that is completely free to enter. Please have a look at the official entry flyer for more details (click the image below). Do not worry if you cannot open our link. It is a technical fault experience by a few of our readers, we are investigating. or via our contact form on the site.